Momentum Performance Universal Muffler UNIVERSAL - Dezod Motorsports Inc - Home of the automotive performance enthusiast since 2002. The Momentum Performance Muffler is available as a standalone product for anyone who wants to build their own custom exhaust system. The muffler provides a high flow design that improves power output while at the same time introducing a unique exhaust tone that adds a personal custom touch to any vehicle. 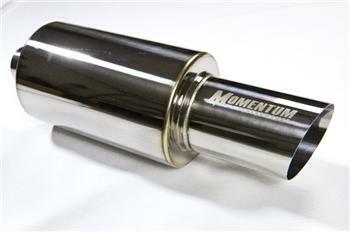 Each Momentum Performance Muffler features robotic TIG welded construction and a mirror polished finish over a stainless steel canister, offering a highly durable and corrosion resistant exhaust solution.